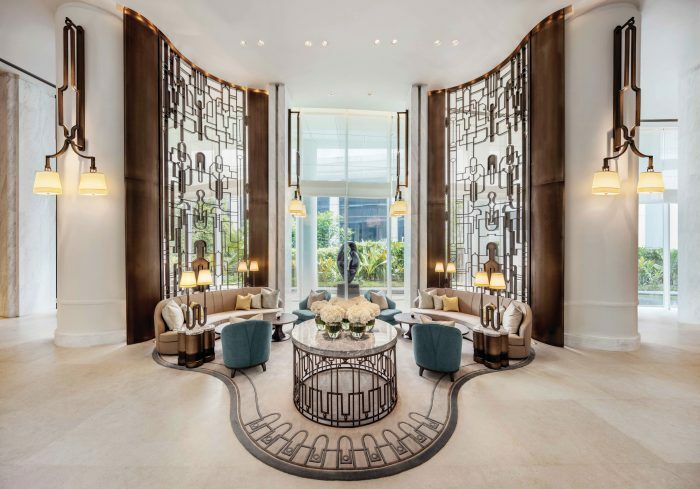 Just one year after the Waldorf Astoria began work on its first Thai property in 2013, the country struggled with anti-government protests. Two years after peace was restored, the king died and the country went into mourning. The past decade hasn’t been easy on Thailand’s tourism scene but its recovery has been remarkable, with 34 million visitor arrivals in 2017 compared to 25 million in 2014. Spring has finally arrived for the industry and the Waldorf Astoria Bangkok has blossomed just in time for it. 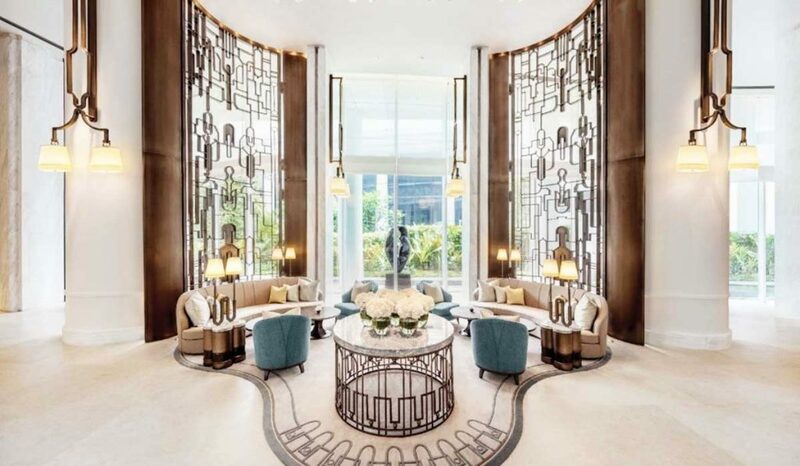 The hotel is set up in the iconic Magnolias Ratchadamri Boulevard, with the striking building named after the flower that inspired its architecture. Its interiors were designed by Andre Fu, whose work in Singapore includes Andaz Singapore and The Fullerton Bay Hotel. 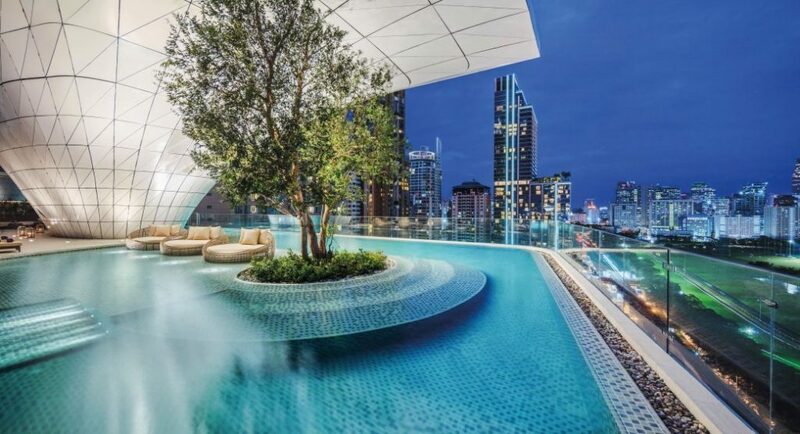 Drawing on the futuristic yet organic style of the building, Fu sought to reimagine the hotel group’s legendary Art Deco image into one that harmonises with Thai culture. The result is immensely soothing. Curving hallways and pillars meet dramatic floor-to-ceiling burnished bronze screens in the upper lobby, with a motif inspired by the arched finger silhouettes of Thai classical dancers. Wall-hung and table lamps cast a warm glow on white Carrara marble walls, and bespoke furnishings are finished in calm, desert colours. “I wanted to translate a sense of sensuality and fluidity that unfolds as you progress,” he says. The Waldorf Astoria holds up its end of Fu’s vision experientially. “The luxury traveller today requires privacy and exclusivity. It’s all about social currency and hyper personalisation,” says Daniel Welk, vice-president of operations, luxury and lifestyle for Hilton Asia Pacific. Limousine transfers are par for the course for luxury hotels, but the Waldorf Astoria takes it a step further by having a staffer video-call you via Skype on the car’s iPad, to show you your room all made up and ready for your arrival. The hotel occupies levels six to 16 and 55 to 57 of the 60-storey building, with 171 appointed guest rooms and suites. Over 2,000 pieces of locally commissioned decor and artwork positioned throughout the property imbue an otherwise modern hotel with a sense of history, and that is mirrored in each room through intricate bronze screens, elegant bar cabinets, hardwood floors and a dusty gold palette. All guest rooms enjoy floor-to-ceiling windows but the best views overlook the city and the Royal Bangkok Sports Club, where horse races are attended by the city’s social elite. The two-bedroom Royal Suite is the largest room category at 300 sq m and features two bedrooms, a living room, a dining room that fits eight, and a fully equipped kitchen and bar counter. Even for those whose hotel loyalties lie with other five-star chains, the Waldorf Astoria Bangkok is worth a visit for its dining options alone. The lower lobby is home to Front Room, where chef Fae Rungthiwa Chummongkhon combines her experience from Michelin-star establishments like Frederikshoj in Denmark and La Belle Epoque in Germany to serve Thai ingredients prepared in a Nordic cooking style. What ends up on your plate is neither strictly Thai nor Nordic, but pure imagination. Andre Fu isn’t the only creative star to shine here. The top three floors of the hotel were designed by studio Avroko, a veteran in creating stylish eateries and bars. On the 55th floor, the 80-seat Bull & Bear specialises in grilled meats and seafood. Its name is inspired by movements in the financial markets, so expect a dignified ambience full of ebony and bronze, where deals may close under a magnificent chandelier (comprising 800 hand-moulded glass feathers) and over a shrimp cocktail. The grandeur continues up a golden central staircase leading to The Loft, where it feels more like the Waldorf Astoria of old. Styled with the Art Nouveau and Art Deco periods in mind, the standout feature of this cocktail bar is a communal table made from reclaimed teak wood boards and finished with paint and materials from a working artist’s studio. Sitting at the very top on the 57th floor is the Champagne Bar. The intimacy and attention to detail – such as an ornate door with a hidden mechanism to open it, vintage glass chandeliers, rocking chairs, wood sculptures – makes this an excellent spot for a romantic nightcap. While champagne dominates the menu, you won’t want to miss out on having a cocktail or a spirit on the rocks, when the ice cubes are carved directly from an old-fashioned, microwave-sized block of ice on the bar counter.